I love easy fresh apple cake recipes like this recipe for apple nut cake as this is a simple easy fresh apple nut cake recipe made from scratch using fresh apples and chopped nuts. 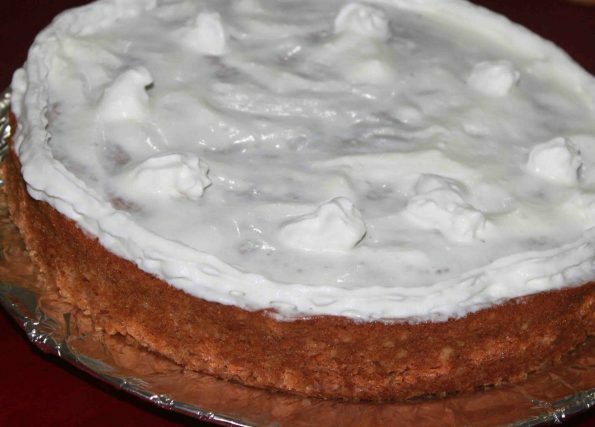 Another simple, easy and delicious very moist fresh apple cake recipe is here. 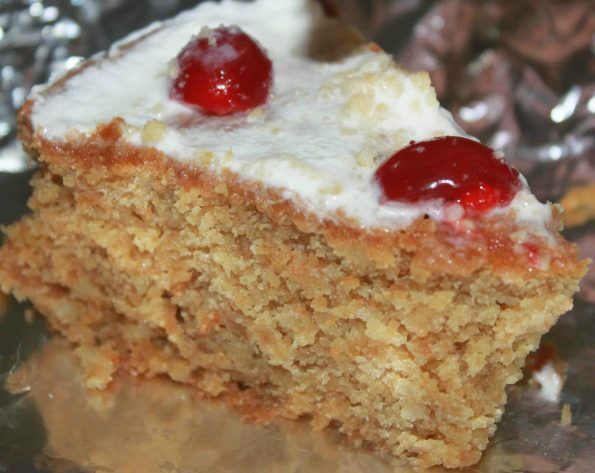 This recipe for apple nut cake is easy to follow, have the flavor of fresh apples and crunchy chopped cashew nuts in them and it is homemade from scratch. This easy, moist, delicious and easy to make homemade apple nut cake recipe made from scratch uses fresh apples and cashew nuts. But you may also use other nuts like almond flakes or pecans if you want to experiment with new flavors. As I already mentioned, this easy and fresh apple cake with nuts is simple to bake and full of apple flavor with crunchy cashew nuts. 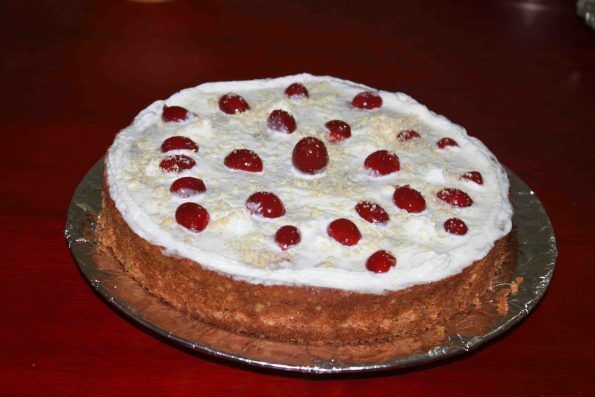 You usually find apple cake recipes calling for sliced apples in it, but this cake is different as this one has grated apples which is added to the cake batter before adding the chopped fresh cashew nuts. 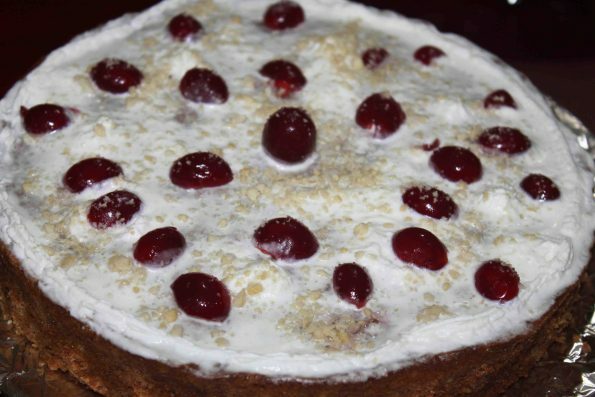 When I decided to bake a fresh apple cake I thought about adding chopped nuts to the cake and I decide to go with cashew nuts as I wanted a unique and exotic nutty flavor to my cake. The fresh apple nut cake full of apple flavor and nuts turned out delicious! So here is how you can make this easy, fresh and delicious apple cashew nut cake following this easy recipe for apple nut cake using fresh apples and cashews. 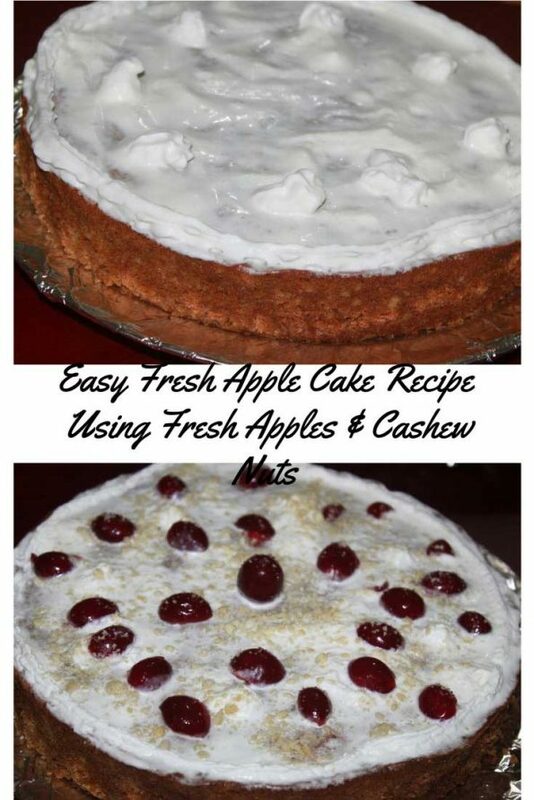 This easy recipe for apple nut cake uses fresh apples and cashews to make a very simple and delicious cake for dessert. Mix the dry ingredients ( flour, baking powder and baking soda) in a bowl. In another bowl, beat eggs and sugar very well. Then add the melted butter and vanilla essence to the mix and combine well. Fold in the grated apples. Combine the dry ingredients to the egg sugar mixture slowly and stir properly. Finally add the finely chopped cashew nuts to the cake batter and mix well. 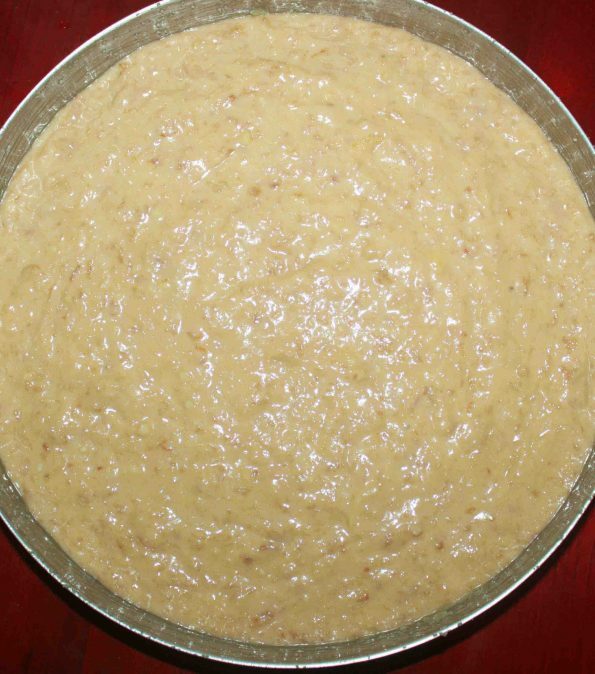 Grease a cake pan with butter and pour the cake batter. 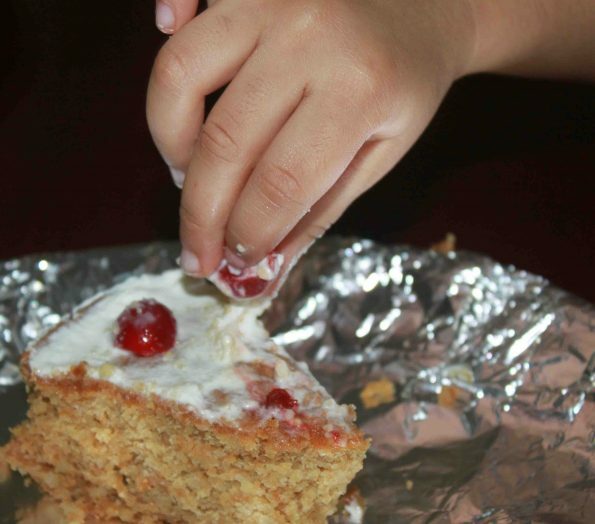 Bake for about 45 to 50 minutes or until a toothpick inserted comes out clean. 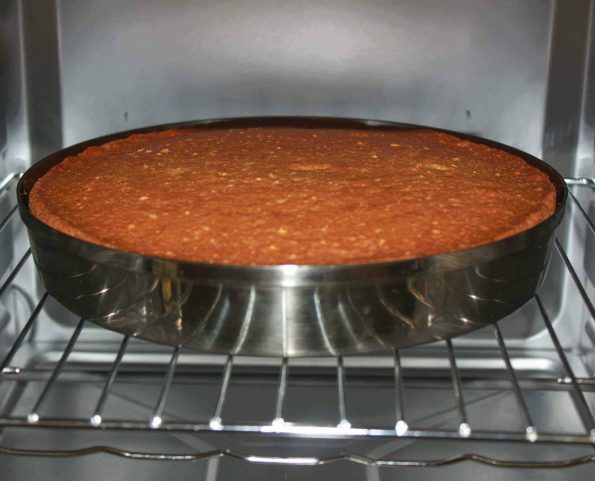 Once it is done, allow the cake to cool down in the rack. Let it cool completely before cutting. My cake was done in 50 minutes and here is how it was looking before frosting. I applied the frosting using vanilla flavored whipped cream. 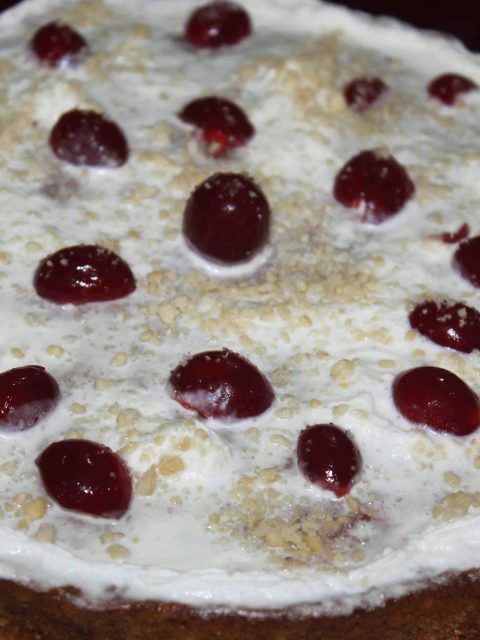 I also used some cherries and little chopped cashew nuts on top of the frosting. Hope you liked the post and enjoyed the pictures!